The Troggs (originally called The Troglodytes) are an English rock band formed in Andover, Hampshire in 1964. They had a number of hits in the United Kingdom and the United States. Their most famous songs include the US chart-toppers "Wild Thing", "With a Girl Like You" and "Love Is All Around", all of which sold over 1 million copies and were awarded gold discs. "Wild Thing" is ranked #257 on the Rolling Stone magazine's list of The 500 Greatest Songs of All Time and was an influence on garage rock and punk rock. Reg Presley (lead vocals) and Ronnie Bond (drums) were childhood friends and in the early 1960s formed an R&B band in their home town of Andover. 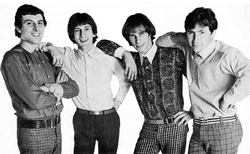 In 1964 they were joined by Pete Staples (bass) and Chris Britton (guitar) and became the Troggs. They were signed by Larry Page, manager of the Kinks, in 1965. They recorded on Page's Page One Records, and Page also leased them to CBS for the debut single "Lost Girl". Their most famous hit was the single "Wild Thing" (written by Chip Taylor) (the song on the b-side of the single depended on the country where it was sold), which with the help of television exposure on Thank Your Lucky Stars reached number 2 in the UK (c/w Reg Presley's song "From Home") and number 1 in the United States in July 1966. Its combination of a simple heavy guitar riff and flirtatious lyrics helped it to quickly become a garage rock standard. It was recorded in one complete take (take two) at Olympic Studios in London, with Keith Grant engineering. Because of a dispute over US distribution rights, "Wild Thing" was released (along with the first album of the same name) on two labels: Fontana and Atco. The band's success in the US was also limited by not touring there until 1968. They also had a number of other hits, including "With a Girl Like You" (a UK number 1 in July 1966, US number 29), "I Can't Control Myself" (a UK number 2 in September 1966; their first UK single release on the Page One label, POF 001; this was also their second and final dual-label release in the US, with Fontana retaining the rights to all subsequent releases), "Anyway That You Want Me" (UK number 10 in December 1966), all at Olympic Studios, "Give It To Me" (UK No.12 1967), "Night of the Long Grass" (UK number 17 in May 1967), "Love Is All Around" (UK number 5 in November 1967 and US number 7 in May 1968) plus "Hi Hi Hazel" (UK No.42, 1967) . With chart success later eluding the band, they split up in March 1969. Ronnie Bond was the first to release a solo record, with the "Anything For You" single in March 1969, followed in April by Reg Presley with "Lucinda Lee". Chris Britton released a solo album, As I Am, the same year. The band reformed later that year, with former Plastic Penny bassist Tony Murray replacing Staples, and Richard Page occasionally filling in for Britton that year. In 1974, after a spell on Pye Records, in an attempt to re-create their 1960s successes, the Troggs re-united with Larry Page, now running Penny Farthing Records. The resulting cover version of the Beach Boys hit "Good Vibrations" did not capture the public's imagination. A reggae version of "Wild Thing" also failed to chart. The band found a sympathetic ear at French label New Rose in the 1980s, the label releasing 1982's Black Bottom LP and 1990's AU. In 1991, they recorded Athens Andover, an eleven-song collaboration between themselves and three members of R.E.M. It was recorded in the American band's hometown of Athens, Georgia, and was released in March 1992. The band attempted to capitalise on this new exposure with a couple of bizarre collaborations on new versions of "Wild Thing". In 1992 they teamed up with actor Oliver Reed and snooker player Alex Higgins, with another version the following year featuring Wolf from the TV show Gladiators, which actually reached number 69 in the UK Singles Chart. In 1994 Wet Wet Wet's cover of "Love Is All Around" was #1 in the UK for 15 weeks, netting Presley a handsome royalty. The band's original drummer, Ronnie Bond, died on 13 November 1992. In January 2012, after over 40 years of touring, Reg Presley retired due to lung cancer, apparently ending the Troggs. However, the remaining members, Chris Britton (guitar), Pete Lucas (bass) and Dave Maggs (drums), continued the band and went back on the road with new lead singer Chris Allen. Reg Presley died on 4 February 2013 at age 71. The Troggs are widely seen as a highly influential band whose sound was an inspiration for garage rock and punk rock. Influential American critic Lester Bangs "called the band the progenitors of punk", according to NPR. 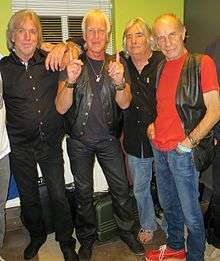 For example, the Troggs influenced artists such as Iggy Pop, and the early version of British pop-punk pioneers Buzzcocks featured "I Can't Control Myself" in their live repertoire. The Ramones are also amongst punk bands who cited the Troggs as an influence. "I Can't Control Myself" is perhaps the most enduring favourite of critics; it continues to be championed for its originality and lasting influence by radio hosts such as "Little" Steven Van Zandt. The MC5 covered "I Want You" at their live shows and recorded the song for the album Kick Out the Jams, although they renamed it "I Want You Right Now". The Jimi Hendrix Experience famously covered "Wild Thing" during their appearance at the 1967 Monterey Pop Festival, introducing it as the British/American joint "national anthem", and climaxing with Hendrix burning his guitar. More recently performing a live version of "Wild Thing" featuring Queen guitarist, Brian May to open the rockers 'Wildlife Rocks' event at Guildford Cathedral in May 2014. A specially-tailored version of "Give It To Me" featured in the Sadie's Daydream sequence of Michelangelo Antonioni's 1966 film Blowup. In 1990, the first hit for (and first single by) the band Spiritualized was a cover of "Anyway That You Want Me". This cover was later used in the movie Me and You and Everyone We Know. "With a Girl Like You" is featured uncut in a school dance scene from the 1991 Nicole Kidman/Noah Taylor movie, Flirting. It is also featured in Shine, The Good Night and The Boat That Rocked. In 1991, "Love Is All Around" was covered by R.E.M. during live performances and was released later that year as a B-side on their "Radio Song" single. They also performed an acoustic version of the song on MTV Unplugged. In 1994, Scottish band Wet Wet Wet's version of "Love Is All Around" spent fifteen weeks at number one in the UK after its inclusion in Four Weddings and a Funeral. The authorship royalties enabled Reg Presley's 1990s research and publication on extraterrestrials and other paranormal phenomena. The point-and-click adventure game Hopkins FBI features "I Can't Control Myself" and "Lost Girl". A modified version of "Love Is All Around" was featured in the film Love Actually (2003), performed by actor Bill Nighy. "The Troggs" was the name of the high school gang in the movie Bang Bang, You're Dead, who persuade the main character to join them in attacking their high school. "Trogg" is the name of one of Bane's three henchmen in Dennis O'Neil's Batman: Knightfall comic arc. The other henchmen are Byrd and Zombie, named after two other popular '60s rock bands, the Byrds and the Zombies. An in-studio tape of Reg Presley's running commentary on a recording session, filled with in-fighting and swearing (known as The Troggs Tapes), was widely circulated in the music underground, and was included in the Archaeology box set, as well as the compilation album, The Rhino Brothers Present the World's Worst Records. The in-group infighting is believed to be the inspiration for a scene in the comedy film, This is Spinal Tap, where the band members are arguing. Some of this dialogue was sampled by the California punk band The Dwarves on their recording of a cover version of the Troggs song "Strange Movies". In 2012, Norwegian band Ulver covered the song "66-5-4-3-2-1" for their covers album Childhood's End. ↑ Nielsen Business Media, Inc. (30 December 2000). Billboard. Nielsen Business Media, Inc. p. 90. ISSN 0006-2510. 1 2 3 4 Unterberger, Richie. "The Troggs biography". allmusic.com. Macrovision Corporation. Retrieved 21 March 2008. 1 2 3 4 5 Strong, Martin C. (2002). The Great Rock Discography, 6th edn. Canongate. ISBN 1-84195-312-1. ↑ Murrells, Joseph (1979). The Book of Golden Discs (2nd ed.). London: Barrie and Jenkins Ltd. pp. 213–214, 232. ISBN 0-214-20512-6. 1 2 "Presley: Troggs Never Left Scene". Bluefield Daily Telegraph. West Virginia, Bluefield. 13 August 1975. p. 49. ↑ Billboard – Google Books. Books.google.com. 9 July 1966. Retrieved 26 March 2012. ↑ Billboard – Google Books. Books.google.com. 3 December 1966. Retrieved 26 March 2012. ↑ "Reg Presley of the Troggs dies aged 71". BBC News. Retrieved 5 February 2013. ↑ Ulaby, Neda, "Reg Presley, The Voice Of 'Wild Thing,' Dies", NPR, 5 February 2013. Retrieved 5 February 2013. 1 2 3 4 5 Roberts, David (2006). British Hit Singles & Albums (19th ed.). London: Guinness World Records Limited. p. 567. ISBN 1-904994-10-5. 1 2 3 4 5 6 7 8 9 10 11 12 13 14 15 16 17 18 19 20 21 22 23 24 25 "The World's Music Chart (Song Artist 676 - The Troggs)". Retrieved 5 February 2013. ↑ "charts.org.nz - New Zealand". Retrieved 6 February 2013. "Any Way That You Want Me"
"Night of the Long Grass"
"You Can Cry If You Want To"
"I'll Buy You an Island"